The first Methodist house of worship in Marlboro County was at Beauty Spot, two miles north of here, where, in 1788, Bishop Asbury attended a meeting. By 1834, the first church in town had been built here on 1 ½ acres of land donated by W. J. Cook. 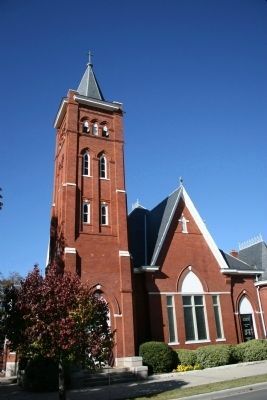 A second building was erected about 1871. The present church dates from 1900 and was extensively renovated and improved during 1955 and 1956. Location. 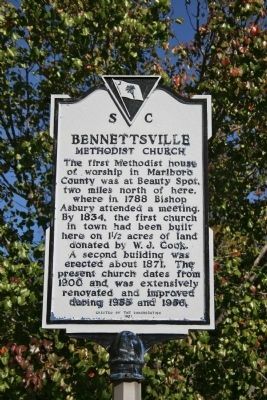 34° 37.115′ N, 79° 40.8′ W. Marker is in Bennettsville, South Carolina, in Marlboro County. Marker is on E. Main Street. Touch for map. Marker is at or near this postal address: 311 E. Main St., Bennettsville SC 29512, United States of America. Touch for directions. away); J.F. Kinney House / P.M. Kinney House (approx. ¼ mile away); Confederate Civil War Monument (approx. ¼ mile away); a different marker also named Bennettsville (approx. ¼ mile away). Touch for a list and map of all markers in Bennettsville. More. Search the internet for Bennettsville Methodist Church. Credits. This page was last revised on June 16, 2016. This page originally submitted on November 16, 2010, by David Bullard of Seneca, South Carolina. This page has been viewed 372 times since then and 4 times this year. Photos: 1, 2. submitted on November 16, 2010, by David Bullard of Seneca, South Carolina. • Bill Pfingsten was the editor who published this page.